Generation Y has been called by the New York Times the “entitled generation.” This is no surprise to the classroom teacher. Almost everyday during “teacher lunch” (25 minutes of choking down food while having students come in and out to ask questions), a teacher has a story of an entitled student. More and more often students ask for completion grades (getting credit for doing the work regardless of whether it is right or wrong – arghhh) or students (and even parents) asking for extensions to work because they have been busy. Everyone seems to be the “entitled” to live by his or her own set of rules. This sense of entitlement comes from believing something to be true without the foundation or personal knowledge to back it up. Many students have grown up hearing, “you’re so smart, athletic, artistic, good, great, ____________.” Not only do they believe this, but they expect everyone else to already this about them. I’ll never forget a conference I had with parents, who requested the student not be there, who asked me why I told their child he/she wrote a bad paper. I started looking around the room for the hidden camera but realized it was no joke. I replied that the paper was bad and was then informed that I had hurt the student’s feeling by telling them this. Here’s the thing: it’s okay to tell the truth to our children because this is how they learn and grow. (And the paper did need some work). We see this on almost athletic fields with young children. Who gets the trophy at the end of the year? Everyone on the team. 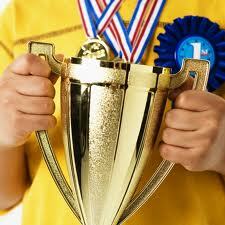 A parent recently told me that her child asked her why he got a trophy when he wasn’t any good at soccer. Kids are not dumb, so let’s quit insulting them. Not everyone deserves a trophy. Our kids are paying the price of adults continuing to not want to hurt their feelings so we attempt to build their self esteem without a foundation for it to be built upon. I’m not proposing that you never compliment your child, but I am proposing that as parents we need to rethink how we do this. Work hard to attach a compliment to a specific action. If your child has just finished a long book, feel free to say, “That seems like a really difficult book; you must be smart to read that.” If your students comes home with an A average, feel free to say, ” wow, you worked really hard or that must have taken a lot of brain power.” But if your kid has just stood in center field counting clovers and chasing butterflies, by telling him or her that they will one day be a MLB Hall of Famer, you are setting yourself up to having an entitled kid. When complimenting your child this week (and please do), are you noticing that you are connecting the compliment with a specific action? Someone had to say this – and you’ve said it well. Thanks! I think a lot of people mean to do well but in turn hurt our kids. I think you are being generous. It’s a form of self- protection. What does this say about me as a parent? It hurts ME to see him suffer even if the final outcome is positive (writing a better essay, being motivated to try to do something well enough to EARN a trophy). We can stand the feeling of our kids disappointment, even for the greater good. I think part of the entitlement that we are looking at can be seen in the parents’ reaction when the child gets into any kind of trouble – the holloway (?) party comes to mind. Kids get drunk, post pictures, the owner of the home shares the pics the kids posted and the parents threaten to sue him. Those kids are entitled to destroy that house and brag about it, but how DARE he repost their pictures. I agree. You and I have been in the classroom (and life) long enough to know some people just find it easier to be the victim than to accept responsibility. Most of my students don’t fall into this category; however, you would think otherwise because the ones who are of the victim mentality make the most noise. It’s sad, and society willl pay the price for it.